I just finished a very extraordinary read, a short comedy novella to be specific. I have to say that I didn’t expect to enjoy it, but oh how mistaken I was. Barry Harris works as a gardener, but have always had a dream about being a ninja. His father trained him to be one, but Barry’s father disappeared before he was able to finish the training. Barry has some physical hinders as well, but who cares? His sister is missing, his father is missing, and he still lives with his mother who listens to metal music. Strictly speaking, a whole lot of things are aloof in Barry’s life. One day Barry discovers that the hedge he is working on is staring back at him, and from that moment on, his life will never be the same. So, Escape from Samsara, where to begin? To be brutally honest, and I wrote this to Blue as well, I wasn’t sure I was going to enjoy the book when I started it, but what really pulled me in was the great language in the book. Blue has used a very British language, and by that, I mean British terms and wording. It makes it more fun to read, and since it is a comedy novella its perfect! I tried to read the story with a British accent, and I found the attempt quite hilarious, in my personal opinion. This may not work for British people since they already have the accent, but for the wannabe’s in the world its perfect! The more I read the more engaged I became with the story. I found it very funny that just a few days prior to starting this book I had discussed how I liked to read things that are more down to earth with a friend of mine. 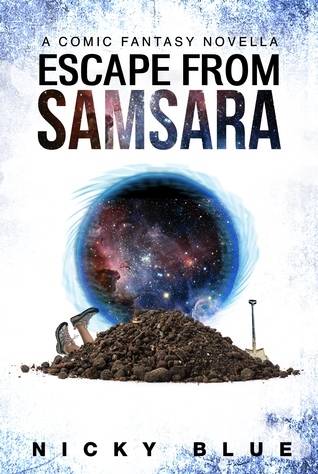 Escape from Samsara is EVERYTHING but down to earth. When I read the synopsis for this book I was quite sure that it wasn’t quite my cup of tea, but I was willing to give it a go, because ‘Never judge a book by its cover’ and all that, and I’m really glad I did give it a go because I ended up really enjoying it! This story has it all, including the Family Guy kinda humour (another reason for why I thought I wouldn’t like it, but hey! Surprise!). While reading about Barry you meet ninjas, crazy hairdressers, bratty children, and sexually frustrated ex-girlfriends all thrown into a hilarious mix that will make your stomach muscles cramp. My favourite thing with this whole story was the numerous plot twists. You never knew what was coming within the next couple of pages. Even with all the craziness, there is a red line in the story that connects everything neatly together. Escape from Samsara is the funniest book I’ve read so far in 2019, and it will take some serious humour to top it! Give it a shot if you enjoy funny fantasy, and if you’re not into that kinda stuff maybe you’ll be as surprised as I was. It is the first book in a series from Nicky Blue, and I’m already excited to see where the next book is going to take Barry! Has anyone else but me noticed how many times I’ve written that exact sentence just this year? ‘It is the first book in a series’? Maybe it will be my line for the year? Sorry, digression. Give the Allocation Prophecy series a go this year!